It’s nice to know that guitars can still surprise me. This one was certainly a surprise. This is a lovely little Martin. It’s in for a neck reset. Looking at the guitar before I started, it was very obvious that the neck had already been off at some point. It wasn’t re-attached terribly well and had been shimmed near the fingerboard as if it had been over-set during a previous neck reset. So, I didn’t anticipate everything would be factory-pristine in there but I wasn’t expecting this. It’s a bloody-great hole. Look at the close-up inset. And there’s another one around the other side. I’m guessing what happened is that the last person to remove this neck didn’t have a good grasp on how to do it non-invasively. He or she removed the heel-cap (that little bit of wood glued to that vaguely-triangular part at the bottom of the heel) and drilled two enormous holes into the dovetail to try to gain access. To be fair, that heel cap is reattached really well—I hadn’t noticed any evidence it had been off but it must have been. This isn’t the best way to remove an acoustic guitar neck. Here’s how I perform a basic neck reset if you’re interested. I can’t just glue this neck back in like that. Since the holes were drilled, they’re round. A couple of lengths of dowel—slightly down-sized first—will do the trick. You can See that the near dowel protrudes past the dovetail and into the continuation of the hole in the ‘face’ of the heel. Anyway, once the glue’s dry, it’s a simple matter to cut away the excess dowel with a chisel. Now, maybe I can get on with that neck reset. Martins are generally quite nice guitars to perform neck resets on. They're usually well made and the way they construct their instruments makes resetting a little more easy. Martin applies finish to necks and bodies separately and then assemble them, so there isn't the same risk of lacquer chipping and cracking when the neck is removed. Also, Martin applies glue to the interior of the dovetail joint and not between the neck heel and body. This is more than sufficient to give a strong joint and makes it easier to disassemble. Very occasionally, I'll come across a Martin that is the exception to the rule Maybe it's a Monday-morning-guitar thing but sometimes the guitar gods throw you a curve-ball. Check out my last post on Martin Neck Resets for the 'right' way for the job to go. I'm not going to go over all that information again—I'll just talk about that curve-ball I mentioned. 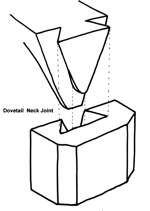 Dovetail neck joint - body-end. This neck-joint had a lot of glue. Seriously, a LOT of glue. The arrows in the image above show that there was tons of glue on the 'cheeks'—the part that contacts the side of the guitar body. This isn't a major problem (lots of manufacturers—Gibson for instance—make this a glueing surface) but it does slightly complicate an otherwise straightforward Martin reset. If I didn't know better I'd have said this neck had already been off and re-glued but there were no signs that was the case. Further complicating things, there was no gap at the back of the joint. There's usually a small gap between the male and female parts at the back of the dovetail and this is a nice access point to get steam in. Not so lucky here. 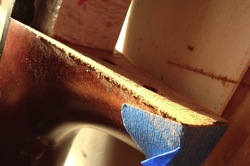 I ended up having to drill a few holes to try get good penetration for the steam all over the joint. This made for very slow going. You need to be careful as you obviously can't see inside the joint until it's disassembled. Sometimes guitars fight back. This one took a lot of wrestling, a lot of steam, and a lot of swearing. I’ll have a couple of articles about neck resets appearing in the near future, so I thought it might be an idea to discuss what they are and why they might be needed. If you have almost any steel-string acoustic guitar for long enough, odds are it will need a neck reset at one (or some) point(s) in its life. Wood settles and string tension pulls the guitar’s geometry around over time. The upshot can be that the action gets slowly higher and higher so that it’s uncomfortable to play. Often, you’ll find a saddle that’s been lowered, again and again, until it’s just a sliver of bone poking over the bridge. If this is the case, and the action’s still high, a reset might be on the cards. What happens in a neck reset? During a neck reset, the neck is removed and the angle at which it joins the body is modified to tilt it back a little. This means it follows the plane of the strings more closely. To try illustrate this, I’ve included one of my, patented, Haze Guitars Hastily And Clumsily-Drawn Exaggerated Diagrams. On Guitar 1, the action is pretty high. Nobody wants to play Guitar 1 and, when he goes to the beach, Taylors come up and kick sand in his sound-hole. Poor Guitar 1 could use a neck reset. The neck is removed so that we can alter the angle at which it connects to the body. We take some wood off the heel—removing a wedge so that the neck tilts backwards a little when it’s reattached. What we have essentially done is pivot the neck at Point A. In doing so, we’ve moved it so it’s more in line with the plane of the strings and the action is magically reduced. Guitar 1 is transformed into Guitar 2. A shredder picks up Guitar 2 and plays so fast that he spontaneously combusts. All is well with the world. Is it a big job? Well, first know that removing a neck generally involves either undoing bolts or steaming glue-joints to soften the adhesive. Neck resets, therefore, range from relatively-easy (Taylor NT necks), to a-bit-more-hassle (bolt-on necked guitars) to break-out-the-steamer-and-the-tea (Martins), to break-out-the-steamer-and-the-whiskey (Gibsons), to oh-god-not-a-bloody-Guild (Guilds). Bear in mind, also, that neck resets will often require additional work afterwards. Fret work — likely a fret level or even a full refret is a strong possibility (and the latter may require a new nut too). Some finish touch-up might even be necessary (although this isn't needed too often). A neck-set should generally be considered relatively serious surgery as it involves some invasive work (in removing the neck) and some potentially disastrous work if the modifications to the heel aren’t performed properly. I’m all in favour of people doing some DIY but a neck set might not be the job for that guy you know who's 'handy'. Ask around, get some advice and have a good chat to whoever you approach to do the job. It's important to trust whoever you get to do this for you. The string tension on your acoustic guitar depends on a few factors. String gauge, scale-length and tuning all play a part but if you assume somewhere around 200 pounds of pressure, you'll be in the ball-park. If you sat there with 200lbs on your shoulders for years, odds are you might begin to buckle a bit. Your acoustic guitar holds up better than you would but that tension can take its toll. If you have any steel-string acoustic guitar for long enough, chances are good it'll need a neck reset at some point in its life. That string tension alters the geometry of the instrument and the most obvious way is that the action creeps up to a point were it's uncomfortable or awkward to play. When a reset will be needed is anyone's guess. Different guitars are, well, different. Could be five years, could be fifty. Most guitars have some additional height in the saddle to allow it be lowered, taking the action down with it. This buys some time but, eventually, the same thing can happen. It's not unusual, on older guitars, to see a saddle that's been lowered repeatedly and is little more than a sliver, barely above the bridge. Might be a good time for a reset, then. A reasonable rule of thumb is that, the plane of the frets should be at the same height as the top of the bridge (that's the wooden bit and not the white saddle). 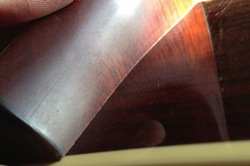 Putting a longish straight-edge on the frets can show you what the story is, as in the photo above. As you can see, it contacts a few millimetres below the bridge-top. Sighting down the frets from the headstock can give you a good idea visually if you don't have a long enough ruler. Basically, we're trying to re-adjust the geometry of the guitar and neck so that straight-edge in the photo gets raised enough to touch or clear the bridge. That means changing the angle at which the neck joins the body. To do this, the neck has to be removed and some wood taken off part of the heel. Dubious arguments about tone aside, if your acoustic guitar has a bolt-on neck, it does make a neck reset a little easier. The first step, you see, is getting that neck off and the easier that is for me, the cheaper it is for you. Bolt-on necks mean less hassle trying to get glue-joints to release. 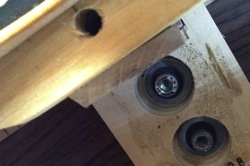 The first image clearly shows the bolts in the neck block (we're looking inside the acoustic guitar here). Straightforward. Excellent. The second image is the inside of the 'top'. The image is taken with a mirror lying inside the guitar. It's always a good idea to get an idea what's going on in here before starting major surgery, especially as bolt-on necked guitars from different manufacturers vary in how the handle things in this area. That block of wood glued to the extension and shoulder-brace, for instance, is worth some consideration. A little work to get that block to disengage and some work on the fingerboard extension is all that's needed here. You can see the way neck and body fit together relatively clearly above. Something I wasn't expecting was to encounter an epoxy-like material in the body mortice around the neck tenon. It was in the area around that white tape (marked with an X in the photo on the left). Because it wouldn't adhere well to this tape, I'm guessing its job was simply to act as a sort of gap-filler to ensure help ensure a solid connection here. Whatever, I noted it for reassembly and cleaned up the residue. Incidentally, I noticed a hairline crack in the heel between the two sockets for the bolts. It was pretty small and probably unlikely to cause problems but I made it good before proceeding to work the wood in this area. The reset itself is done by removing a 'wedge' shape of wood from the heel—more at the bottom, graduating to none at the top where it meets the fingerboard. Calculating the amount to remove can be done by a relatively simple formula but I tend to do that only to get in the ball-park and then finish by eye. The tape in the left photo gives me a line indicating the wood to be removed. There are a few ways to go about this but I like to bevel down to this line and then bring the sides to meet it. Like this. 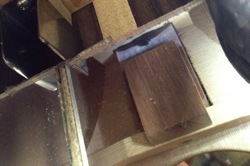 Wood is carefully removed from the sides of the heel now. Very carefully. It would be very easy to mess this up. I don't want to remove any wood from that far end where the heel intersects the fingerboard. Doing that would actually move the neck closer to the bridge and muck up the intonation. What we want to do is to take out that wedge shape I mentioned earlier. When that's gone, the neck joins the body at a slightly increased angle and this means better action. Most of the work is done as shown in the left photo. When the bulk is gone, I'll test fit to the body and I'll remove the remainder of wood using sandpaper between body and neck as in the right image. This helps perfectly shape the heel-fit to the body. It's important to check alignment often. As well as the set angle, I'm checking for side-to-side alignment to make sure I don't take too much off one side of the heel. That would point the neck too much to one side or the other—not good. Once I'm happy with the fit and alignment, it's time to reassemble. In this case, thanks to the construction of this guitar, it's an easy job. Bolted back on and a little glue in the appropriate places—especially on that little block of wood we found earlier on the end of the neck—and we're good to go. And this is what we're looking for. The straight-edge along the frets just skims the top of the bridge. I'll need to make a new saddle to replace this one that's now far too low but that's no problem. We don't need to do any fretwork on this guitar as a consequence of the neck reset (frequently that's not the case) so, all in all, it's been a good day. I'll try to pull together some photos of a more involved neck reset soon. Anything with a glue-in, dovetail neck involves messy work, steaming out the neck. For now, though, I've strung up this baby and it's sounding (and more importantly), playing great. I suspect this deserves a celebratory tea. 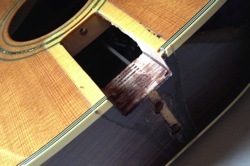 A little ways back, I discussed the removal of an acoustic guitar's neck for repair. I also talked a little about my opinions on the construction of that particular guitar. The neck-removal post was getting a little long so I decided to split out the reassembly part. Putting an acoustic guitar back together generally involves some glueing. Sometimes more and sometimes less. A dovetail neck joint requires this but also needs glue in the joint itself. 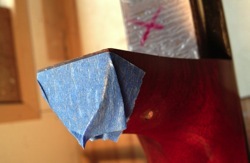 Depending on the manufacturer, the face of the heel (the flat portion that butts against the guitar side) may be glued too. Some guitar makers (Martin, for instance) don't apply glue there while others (Gibson for example) glue it. This is one of the reasons it's a bit more work to perform a neck reset on a Gibson. 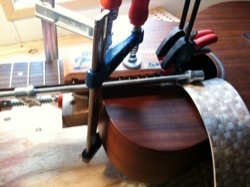 That clamp in the photos—running from the soundhole to the heel—wouldn't normally be required but this instrument's construction made it necessary. The clamp doesn't actually contact the soundhole edge but I've got a piece of linoleum there to play it safe. Once the glue's properly cured, it's ok to unclamp. I replaced the fret I removed (see the previous post) to help steam off the neck, made sure it was secure and level and I strung this little fellow up to make sure it played well. This job was a little more involved than it might be on a different guitar. All that's not important though. What's important is that this guitar is making music again. That's always good. In a previous post, I gave my opinion on what I saw as the problems with the neck-joint design of a guitar I'd recently worked on. I thought you might be interested in some more detail about that repair (without my whinging about design issues). While some of the steps undertaken in this repair are common with any job that involves removing a guitar's neck, you might find it useful to, first, check out some of the ways in which this guitar differed. The guitar had taken a knock and its neck had become detached at the heel. It still appeared to have some attachment towards the guitar top but it wasn't easy to see what was going on. Internally, there was quite a small neck block—too small to accommodate a dovetail—and no sign of bolts although the feeler gauge I inserted seemed to indicate something bolt like. It actually took a chat with the manufacturer's customer service to sort it out. There were no bolts or dovetails—dowels were used to align the neck and the joint was a mortice and tenon. Fixing a problem like this on a guitar isn't just a matter of squirting some more glue in and hoping for the best. A proper job requires that the joint be disassembled and cleaned. If this isn't done, the new glue will not penetrate properly and will only adhere to the older, failed glue rather than to good, strong wood. Removing an acoustic guitar neck involves softening whatever glue is holding the neck to the body. A dovetail requires holes be drilled into the joint so that the glue can be softened by carefully injecting steam. That's not required for a bolt-on neck, of course, but what is common with all joints—including this one— is that the glue holding the fingerboard extension to the guitar's top be loosened. We do this by applying heat. Sometimes that heat is applied using a cast block that I heat on a hotplate. For some jobs though, I use heating blankets. These are much more controllable but you still need to take care. 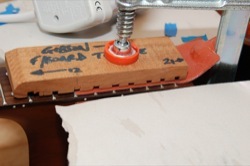 The blanket is clamped—loosely—to the fingerboard extension and I keep a very close eye on it. When I judge that heat has penetrated the board and begun to soften the glue I remove the blanket and get to work with the palette knives. 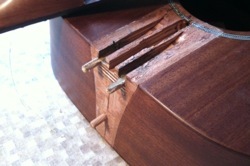 It's a delicate job as too much pressure could easily tear into, or lift grain from, the guitar top underneath. It's often necessary to heat the area a couple of times to separate the surfaces. You can see from the images that the neck has two steel box-sections protruding from the heel. These were glued into the corresoponding channels in the guitar top. I needed to get this glue to soften too but the heating blanket wasn't going to do the trick. It was necessary to use a similar technique to that used for dovetail disassembly. I removed one of the frets on the extension, drilled a couple of small access holes and injected steam (very carefully—these are small channels very close to the guitar top). This process, too, was made more difficult than on a traditional construction. Because of the alignment pins, I could not remove the neck from the body vertically. Instead, I needed to 'pull' the neck away from the side. It made for an annoying job as it's really hard to get any leverage or apply pressure well. I should definitely preface this post by stating that what follows is my opinion only. It may be that I'm alone in these views or it may be that other guitar builders and repair-techs agree. The post below, however, is my take on things. I recently had a Tanglewood TW130 through the shop for repair. It's a nice little acoustic—I've always been a sucker for all-mahogany acoustics. The guitar had taken a fall and the heel had come away from the body. I'll detail the steps taken to assess and repair this damage in a later post but I wanted to discuss the guitar's construction as a separate issue. Historically, acoustic guitars had their necks fixed to the body with a dovetail joint. This is a very strong joint and when glued is damned solid. The dovetail is considered the 'traditional' neck-joint and it tends to be more prized by many who consider it imparts a superior tone to the guitar. 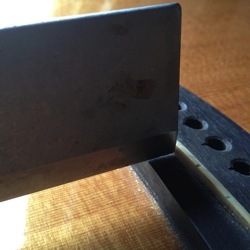 A good dovetail joint tends to require a little more work and care to accomplish well though, and it makes for a little more work when performing a neck-reset on an older guitar. For these reasons (and possibly others), many modern guitar makers use a bolt-on neck joint. In this joint, a short mortice and tenon is cut in the neck block (in the body) and in the neck. This is used mainly for alignment purposes although it provides some strength. 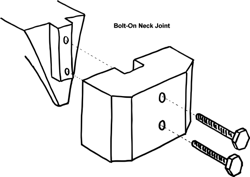 Most of the joint's strength, however, comes from the bolts that are attached, through the neck block, into threaded sockets in the neck heel. These tighten to pull the neck securely into the body and, questionable arguments about tone aside, provide a strong, solid joint. And, when it comes to setting the neck at some stage in the future, it's much easier to undo some bolts than it is to steam out a glued-in dovetail. This Tanglewood doesn't use either of these methods, however. This guitar has a quite small neck block (the part that the neck usually bolts or dovetails to) and has a slightly larger than usual support under the fingerboard extension. The reason for this latter is that there are channels cut here to accept the truss-rod (in the middle) and two square, box-sections of steel on either side. 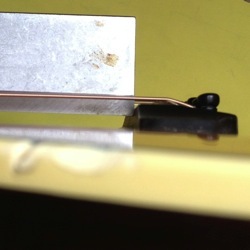 It's these steel sections that—glued into the channels on top of the guitar—that provide the bulk of the joint's strength. 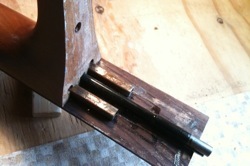 You can see three dowels poking out the front of the neck block/body—one of these is wooden and two are plastic. In my opinion, their primary role is alignment as they're not going to provide much support. The face of the neck-heel—where it butts against the body—is a glueing surface on this guitar and I guess this was considered sufficient support when combined with the dowels and channels. I've a couple of problems with this. String tension does a mighty fine job of trying to pull the headstock of a guitar down to meet the bridge. Poor support along the heel area can only make this job easier. Think of a long-bow. The tension of the bow-string pulls the bow into that arched (bow) shape. That's what the strings are doing on your guitar too. The poor thing needs all the help it can get to resist those damn strings. One knock was enough to break the (slightly brittle) hold this glue had. Dovetail and bolt-on neck joints both pull the neck snuggly into the body. As well as strengthening the joint, this can only help tone and string energy. The Tanglewood's neck is, effectively, sitting on the body with a bit of glue and a couple of pins holding it in place. While it's fair to argue the practicalities of the owner of a lower-cost guitar deciding to plump for a neck-reset at some stage in the future, should that happen, legitimately disassembling this sort of joint would (perhaps counterintuitively) be much more problematic than what was achieved with a simple fall in this case. As it happens, reassembly is more difficult too. Now, I'm not being elitist here. This is not a guitar that cost thousands and there are many valid reasons for manufacturers to economise where they can. I've owned, played and repaired many cheapies and budget instruments in my time and many have been absolutely fine (and some have punched brilliantly above their weight). I've no idea how much money was saved in the manufacture of this instrument in this manner rather than with a regular bolt-on neck and I'm slightly conflicted in passing judgement as it's great the there is now such a selection of fine instruments available for peanuts. It certainly wasn't the case when I began playing guitar. Personally, though, I can't help feeling that the decision to go with this joint over a regular bolt-on has compromised this instrument. At very least, I feel it's durability, and therefore longevity, is compromised. I don't think that's a good thing on any instrument, no matter how much it costs.